The Lake Roland Nature Center provides year-round education and meeting space with a central location near the center of the park. The Center has classroom, educational and meeting space with audio/visual capabilities, plus support space. The main space of the Center can be divided into two sub-spaces. Occupancies can range from 100 people standing, 60 people for lecture seating, and approximately 40 people for a classroom set up. Overall facility capacity including porch is 280. The Center allows the County and the Nature Council to provide year-round education, arts and crafts, and event programming with access for special needs and handicapped participants. Its strategic location and proximity to the existing boardwalk further enhances its “transit oriented nature” — directly accessible from the Mass Transit Falls Road Light Rail Station via a raised boardwalk — the first of its kind in the Baltimore metro area. One key design feature of the Center is that the front elevation facing the dam is comprised of a series of operable glass doors allowing activities to extend onto the deck that provides year around views of the Lake Roland Dam and also allows for increased outdoor educational programs. 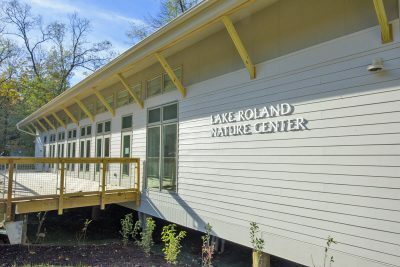 The 2,594 square foot Lake Roland Nature Center is a green focused project utilizing renewable construction materials and a minimal environmental footprint. 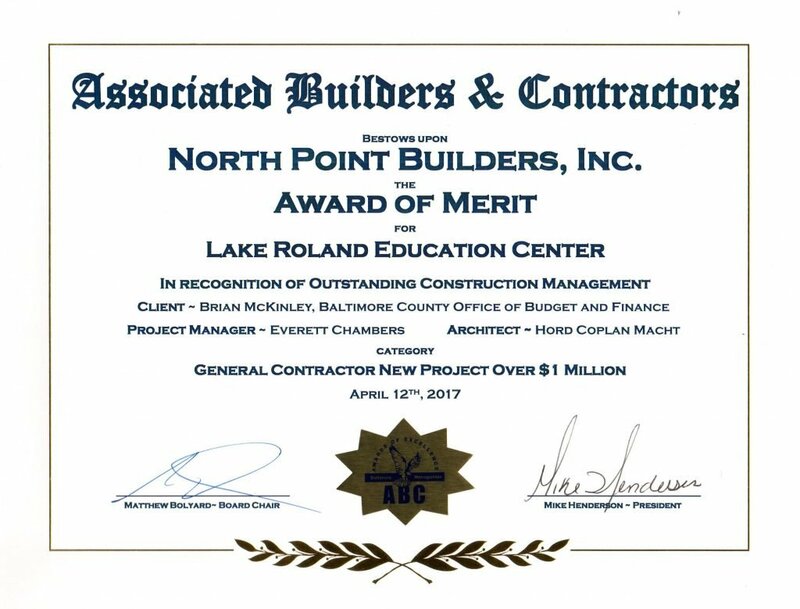 The Nature Center has won the prestigious Associated Builders & Contractors Award of Merit. The Lake Roland Nature Center cost is $1.3 million and has been funded through state, county and non-profit resources including grants and charitable donations. 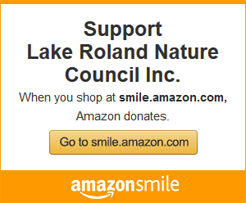 To date, the Lake Roland Nature Council has been able to raise $1.15 million of the $1.3 million leaving a $149,484 shortfall to date. Please help us close the gap in funding this worthwhile park asset. Help us meet the $1.3M fundraising goal and eliminate the shortfall.